Is Apple's new iPod nano advert misleading? One of the biggest criticisms of the new camcorder-equipped iPod nano is that the lens isn't placed where you'd expect it to be. It's not on the back at the top behind the LCD screen like a mobile phone or a Flip Video. It's actually on the back, at the bottom behind the clickwheel. The practical upshot of this is that if you hold the iPod nano like normal, with your thumb on the clickwheel, the rest of your hand ends up obscuring the camcorder sensor. Despite this inconvenient design, Apple's new TV advert makes out that you can casually hold the nano, while filming with no problems at all. And in fact, the back of the iPod nano is not shown at any point in the 30-second ad. If you look closely, all the iPods in the advert are being held with just a thumb and an index finger. And while it is absolutely possible to hold the nano like this, it isn't comfortable. Not at all. And it's also worth a mention that you don't even have to cover the lens in order to obscure it. 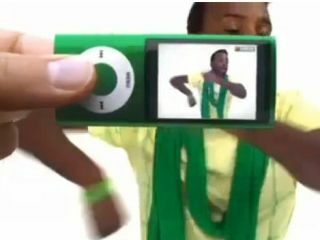 We contacted the Advertising Standards Agency in the UK who told us that they have had one complaint about the iPod nano advert - but it was about the quality of the video shown in the ad, rather than the way the nano was being held. The ASA has not yet decided whether to further investigate this complaint. It's pretty obvious that the lens would work better at the other end of the device. Shouldn't the back of the nano appear in the ad in order to be more clear? Or is it just that everyone in the advert is extremely dextrous and able to skilfully avoid covering the lens by holding their fingers behind the iPod in a set position?